I made a virtual visit with Google Street View beforehand, and it looked promising. The mountain is in a residential area, with a lot of radio and cell phone towers on the top. I parked on Wigley Road just past the place where Summitop Road begins. I only hiked about 0.7 km one way up Summitop Road, but it was quite strenuous (and yes, I did sweat!). I marched past lots of fancy houses, finally reaching a turnaround with another road leading off from it. 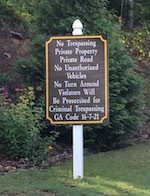 Unfortunately, once I reached that point, I was greeted by a sign stating unequivocally “No Trespassing,” “Private Property,” “Private Road.” According to the satellite photos, this private road is the only road that leads to the top of the mountain, but being a law-abiding citizen, I decided not to proceed. Even though I couldn’t go all the way to the top, there was a decent view as I went back down, and I even spotted a little conical mountain that seemed to be located to the southwest. Looking at the map now, it looks like it may have been one end of Kennesaw Mountain that I was seeing, or maybe it was Blackjack Mountain, a peak hitherto unknown to me! That may be my next mountain climbing destination. So if you are contemplating a trip to Sweat Mountain, I would recommend it if you live nearby. It is a nice little hike with good views. Just keep in mind that you cannot go all the way to the top, unless you want to face prosecution for criminal trespassing! 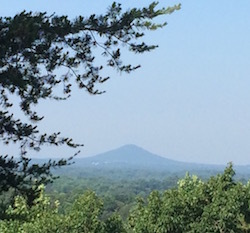 Actually there is a way to hike to the top of Sweat Mtn. You drive down Wigley Road until it ends and then just bushwhack a bit and then there’s actually a trail of sorts that you will hit that takes the ridge to the summit. It is only about .7 mi one way, although the summit is fenced in with radio towers, so you can’t get to that part. However, there are some nice overlooks almost at the top and it’s a cool area to explore. I’m not sure if it is technically trespassing or not, but there are no signs you hit on the way up on that route. Email me if you would like the GPS track or any other information.